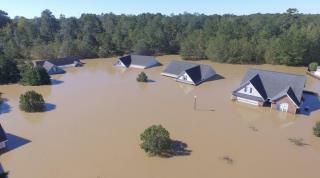 (Newser) – A drone photo, a Twitter hashtag, and a concerned brother more than a thousand miles away all helped save a North Carolina veteran trapped in his home by Hurricane Matthew flooding. Craig Williams, who lives in Austin, Texas, was worried about his twin, Chris, who had fled Saturday night to the second floor of his Hope Mills home with his dog, Lana (who can't swim) after floodwaters filled the entire first floor of the house, the Washington Post reports. Craig, only able to communicate with Chris via Facebook Messenger, says both tried to call 911, but to no avail. Craig then contacted WFMY, which got through to Cumberland County 911, but they said rescues were hampered by the floods. Enter Quavas Hart, also an Afghanistan veteran, who was flying his drone over flooded areas, including Hope Mills, posting pics on social media with the #HopeMills hashtag. Next on Newser: Schindler Saved 1,200 Jews in This Factory. Can It Be Saved? The thing is these types of incidents continue to prove just how stupid people really are. The injuries and deaths could have been prevented if they had done as they were told - GET OUT..
1. Craig knew his brother was trapped. 2. Craig found an online photo of his brother's house. 3. Craig got the photographer to send a rescue boat to his brother. I see a bit of luck involved, but I don't think the Newser narrative illustrated it. I think the above 3 facts should have been written, and then the 2nd paragraph could have embellished, and mentioned the part about Craig not initially realizing he was looking at a picture of his brother's house, and maybe mentioned the dog and the dog's swimming proficiency.